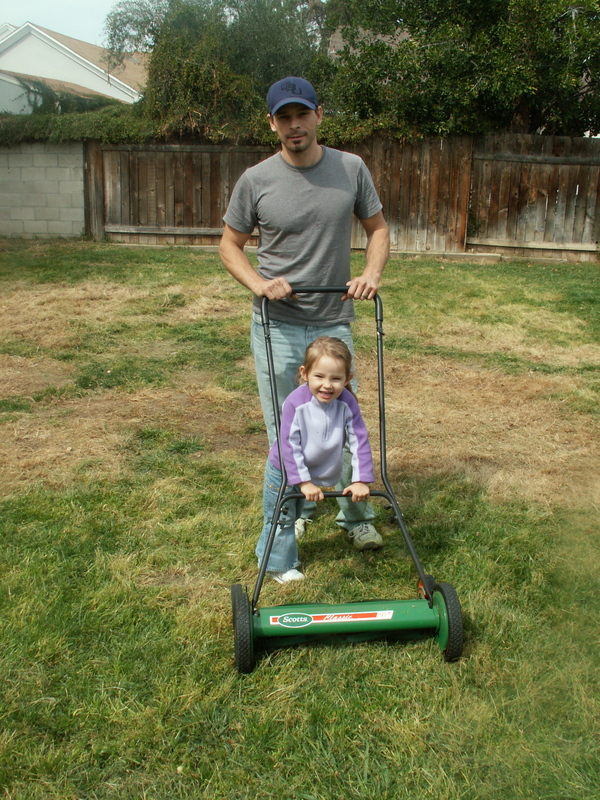 Sadie Rose helps Daddy mow the backyard lawn. We approached this weekend with the stress of major papers and exams weighing down. We committed that this would be a weekend of studying. The girls would have to play in their room and watch TV while Mommy and Daddy prepared for Sunday morning Bible Study, and cranked out major papers due on Monday and Tuesday. But as we awoke Saturday morning, God had a different plan for the Davidson family. Sleeping in. Baking for College Group. Early morning naps for the girls. Playing outside while Daddy weeded the lawn. We ate a wonderful picnic lunch, followed by stroller races, photo opportunities, raking the cut grass and leaves, and absolute delight. Much of the early afternoon was spent running from The Wormy…Sadie Rose’s new imaginary monster. We fought him off with the stroller, and hid in anticipation of the next moment when Sadie Rose would yell, “The Wormy…RUUUN.” I was constantly surprised that he always had a way of sneaking up behind us. Dani and Sadie Rose helped Daddy mow and were ecstatic when Daddy began to chase them around in circles with the lawn mower–Don’t worry, we have a push mower. Much safer. I sat in absolute amazement, with tears almost in my eyes. Married to a loving father might be one of the most beautiful things in the world. His daughters love him, find absolute safety in him, and love to play with him. And most importantly, he loves to play with them. Perfection. After some good running time, Daddy suggested Ice Cream…Of, course Mommy agreed. Over to the plaza, where Daddy and Dani shared a Juice it Up, and Sadie Rose and Mommy each got their own Coldstones–Mommy had vanilla yogurt with walnuts and raspberries, and Sadie Rose had raspberry yogurt with sprinkles and gummy bears. A three-year old in heaven. We sat on our front porch, watching the cars drive by, and the ice cream melt down Sadie Rose’s face, shirt, and shoes. Grandpa would have cringed at the stickiness, and while Mommy was doing a little bit of cringing herself, I let it go. There are other battles to fight, and Sadie Rose was absolutely thrilled. Off to the bathroom to wash up and a late afternoon nap. Mommy and Daddy got a little bit of studying done, but mostly just talked. Good talks. Good times. 6:00 pm came quick and so we awoke the girls for more play in the backyard while Daddy barbecued. Yum. We finished off the night with bubbles, hoola hoops, and dinner–tri tip, bbq vegetable kabobs, bbq asparagus, homemade macaroni and cheese, and sprouted wheat toast. Everyone cleaned their plate! A quick splash in the bath, into pjs, and into bed. Daddy read from John 3, and Sadie Rose memorized John 3:16. Truly a treasured moments in our hearts. This was a good night. A great day. It was late into the night before we sat down again to work on papers and projects. Did we waste our day? We accomplished nothing. Absolutely not. The invested time with our girls is far greater than a perfect grade on a paper. We were once admonished, “If you get straight A’s, then you have neglected your family.” Yesterday, we lived out this admonishment. We put our family first. We delighted in our time together, and it was so worth it! Most definitely a day well spent. And now, Sunday morning, the sounds of waking babies echoes in the distance beyond my headphones of worship. Yes, there is worship even in the sounds of my girls waking–“Mommmmmyyyyy.” Beautiful.